During the last review of the European Directive on animals used in scientific procedures (passed 2010), ADI worked for greater protection and restrictions on primate use; a phase out of use of primates born of wild-caught parents; replacements for animal use. 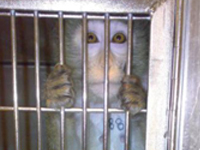 This included a new concept – Thematic Review – a system to allow systematic and critical examination of the scientific justification for targeted animal experiments to establish whether they should be abandoned due to poor science and relevance or because an advanced non-animal alternative is already available. This was adopted under Article 58 of the European Directive and is a realistic mechanism for replacing the use of animals in research, but has yet to be implemented. The obstacles to the robust evaluation of animal procedures and the introduction of advanced scientific methods need to be removed – this both helps researchers to use more sophisticated technology, and saves animals from unnecessary suffering. ADI has outlined a set of proposals for how the European Commission can advance thematic review by carrying out bi-annual consultation with stakeholders to identify targeted areas of animal experimentation, with a view to determining timetables and strategies for replacement. ADI will work with Eurogroup for Animals in urging the Commission to adopt our proposals and put this important piece of legislation into play, saving the lives of thousands of animals used in research.